You’ve probably heard about Obama’s big brain project, the BRAIN Initiative? Also the European Union Human Brain project? You might be tempted to think that these are just one last big push to figure out exactly how the brain really works. Nothing could be further from the truth. The reigning theory is that our brain works something like a computer; with electrical signals making neurons fire. In this telling our brain is just like a von Neumann machine. Sure there are brain chemicals up there that doing something but we have no idea exactly how these two systems, electrical and chemical relate. We now know that there are many more glial cells in the brain than neurons but we don’t know what they really do from the perspective of thinking. The current view is that they scavenge the byproducts of normal brain functioning but that’s just a theory. So in reality we are still the dark ages of brain science, even though there are valiant efforts to turn this around. We are in need of our own brain theory of relativity to give us a breakthrough into seeing what’s actually happening up north. So here’s another try. What if the brain is really a quantum computer? That it works using entangled photons, just like the quantum computers were close to building in the lab? Of course that’s at the very least a heretical and maybe totally stupid idea. After all, how could the brain invent something we haven’t been able to? But of course, the brain evolved millions of years before anyone knew what electricity was, and it somehow worked that one out. And, as I have pointed out in another post, it’s now clear that biology uses quantum effects. We are in the early days yet in our research but you can no longer claim that quantum effects only have an impact at the levels of atomic particles. We now know that biological systems have evolved to use some of these effects in at least some biological systems. Who’s to say that mammalian biology hasn’t already beaten us to the punch and leveraged quantum effects for thinking? Since its beaten us at just about everything else, it might be more surprising if that weren’t the case. Of course if you believe this there’s some heavy stuff to swallow. First and foremost is that a quantum computer can, in principle, calculate all possible values from a single computation. Surely our brain doesn’t do that? Wouldn’t we get totally overloaded with results if that were the case? But here’s a thought. Maybe our brain is so big because it’s using a huge amount of its processing power to block out and filter the vast majority of computational results. In this perspective our brain is really a giant filter to go through the massive dumps we routinely create and to bring them down to a size we can cope with. So in this case our brain is really a filter for the Big Data it creates. We are drinking out of a fire hose and just getting the good water molecules. And is another piece of evidence about the quantum nature of our brain the fact that humans have such powerful conceptual vision? That we can even see to the end of our own universe, as awesome as this feat is, and even to multiple universes? For the religious-minded, is that what helps us see God? So what evidence could one possible have for such an outlandish idea? Well here’s one piece: how about the existence of idiots savants? How can they perform the prodigious feats of computation if it isn’t a mechanism way beyond our current theories? 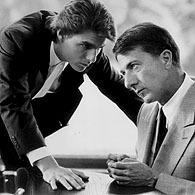 You no doubt have heard about the movie “Rain Man”? It’s loosely based on a real person, Kim Peek, who died in the US in 2009 at the age of 58. In the movie, idiot savant Raymond Babbitt (played by Dustin Hoffman) was able to carry out his prodigious feats in the casinos of Las Vegas. Was he really looking at all the possible combinations in real time? And was that why he was so dysfunctional from a social point of view? That unique thinking mode was using up all his mental energy? And is the autistic nature of many idiots savants an adjustment of their awesome processing power? A warning of what happens if you let your brain go its natural quantum way? Maybe idiots savants are people whose blocking mechanism doesn’t work properly? Technologists are currently working on a quantum computer with 3 or 4 qubits of capacity. Is this a new way of defining the evolution of animal intelligence? Early mammals had one qubit, gibbons have 2, humans have five? Wouldn’t that make more sense in any case than talking about IQ? And if this were true, maybe all of us are really idiots savants in drag. We all have the quantum computer up north but for the vast majority of us, it’s kept in check by the blocking mechanism that conceals the iron fist behind that velvet glove? Remember the movie “A Few Good men” starring Jack Nicholson? Jessep: I'll answer the question. You want answers? Lieutenant Kaffee: I think I'm entitled to them. Lieutenant Kaffee: I want the truth! Jessep: You can't handle the truth! Maybe the notion that we have a quantum computer between our ears is equally hard to swallow. 2019年4月20日, 星期六 DIY stem cells from bone exercise? 2019年3月23日, 星期六 Do most leaders lack business acumen? 2019年3月09日, 星期六 Is AI too left-brained to ensure global survival? 2019年3月02日, 星期六 Employers need to get serious about helping employees to exercise! When Will Cyber-Spying Become Telepathy?